Coming Full Circle & Owning It! I recently had a friend text me and tell me that I have the “most interesting adventures”. My first thought was “I do?” I don’t picture myself as someone who has these interestingly wild, amazing experiences, but as it turns out, he was right. This week I was scrolling through my Facebook page looking for a video I thought I had. 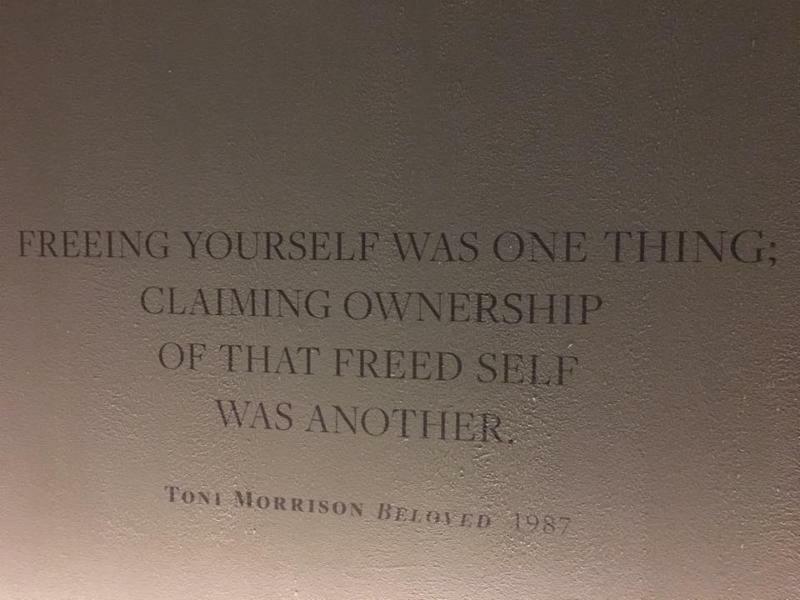 I ran across this photo of a quote from Toni Morrison’s book Beloved. I read this book 22 years ago when I was pregnant with my son. I loved this book because it required I use a dictionary and learn new vocabulary. It was a cold night in DC. The streets were full of hustle and bustle with upcoming activities from other balls, the inauguration and the women’s march. Peggy and I tried to take an Uber to the event, but ended up having to walk several blocks to finish our travel to the museum because streets were blocked off. We arrived early and got into line to await entrance. We began talking to locals who had been to this museum before. We heard about how great the exhibits were and accepted suggestions on things to see since part of the museum would be open during the ball. When we were admitted into the museum, it was filled with exciting energy. Music filled the dim lit space. There were no strangers in the large crowd. There were speakers and performers that I have read about in history books, seen on TV and read about in magazines. The red carpet afforded us the opportunity to get up close to see famous stars, such as Ashley Judd. And the buffet? It was seriously de-lish! We danced, we sang, we moved to the rhythm and rhyme of newly created poems for this particular event. And the “main act” was Beyonce’s sister, Solange. How on earth did I get so lucky to get a ticket to this freaking fantastic event? I wore a black sequence dress and much to my dismay, non Birkenstock shoes. Although I went to Dillards to buy a pair of black Converse high tops to wear with my dress, when the saleswoman heard where I was going she insisted I get a nice pair of dressy shoes. By the end of the evening I was kicking myself for letting her talk me into those shoes. Peggy and I went to tour the first two floors of the museum. I had to sit down every once in a while and take those damn shoes off. One of those moments brought me to this quote that was printed on the wall in front of the bench I was sitting on. Do you ever have moments where you feel like your have come full circle? This was such a moment for me. I first read this quote when my son was still baking in my belly and at this time he was off at college. Now, I’m sitting on a bench in a Smithsonian that people are waiting months to get tickets to get into see and as I rub my feet, here is Beloved coming to me again. My how I’ve changed since first reading this. I’m a mom now, I’ve changed & ‘upgraded husbands’, I’ve changed careers, I’ve opened my own business and I am happy & love doing what I do. Finally, because I married such an awesome person during my ‘upgrade’ I can have this moment- guilt free – and know that my life at home is being taken care of. That trip was another stepping stone in owning my freed self. I was terrified to get on that plane by myself and go experience a weekend that I had no real understanding of how those days would play out. And it was one of the most extraordinary times of my life! One I will never forget. One literally for the history books! Have you freed yourself? From burdens that don’t serve you? From unfair self-inflicted expectations of yourself? Or other’s expectations of you? Have you freed yourself in other ways? Tried healthy things that may be scary? Have you owned your inner freedom? Do you take care of your needs? Without guilt or self-judgement? Do you listen to your instincts? Do you surround yourself with people who applaud your ‘freed self’? If someone would have asked me these questions 15 years ago I would have stared at them like, “WH-AT?” As it turns out, I have not only freed myself in many ways, I am owning it. Thank you Toni Morrison! Start of this New Year learning to, committing to and/or continuing to do just that! Own your freed self!